In the morning a new service starts at Chipstead Square at 0705, and goes via Chipstead Lane and Bullfinch Lane to Ryewood (0710), and then back to Tesco, Riverhead (0713) and then Sevenoaks Railway Station (0715) and Sevenoaks Bus Station (0719). This is in addition to existing 401 services from Westerham serving Chipstead at 0635, 0719 and 0816 and Tesco at 0638, 0722 and 0820. In the evening there will be 401 services every 30 minutes (rather than hourly) from Sevenoaks Bus Station from 1645 to 1945, and picking up at Sevenoaks Railway Station at xx19/xx49. The 1649, 1719, 1819 and 1919 run to Westerham. The 1749, 1849, 1949 follow the usual 401 route as far as Chipstead Corner, but then turn left to serve Bessels Green, Riverhead Square (again) and Ryewood. Arriva say that they are axing route 1 “in response to insufficient numbers of people using them”. That’s disappointing, and it’s a pity that they have not run the service for longer to allow the number of users to build up. It’s to be hoped that commuters in north-west Sevenoaks will take advantage of the new service from Go Coach to ensure that it establishes commercial viability (there’s no subsidy). With a 10-journey Sevenoaks area ticket it’s only £1.20 each way, far cheaper than railway station parking. Use it or lose it! Arriva are also dropping the route 2 which goes from Kemsing, Seal, Bat and Ball to Sevenoaks. Go Coach are picking up the route along with the school bus routes. Again lack of numbers is the reason. Quite significant as without the bus Kemsing would be totally cut off. Surprise surprise that users weren’t that high – maybe it had something to do with the ridiculous route that went all the way around Chipstead, and then turned right to go to Ryewood. No wonder those of us from ‘north west Sevenoaks’ didn’t bother. There will never be a decent service so long as bus travel remains in private hands, we should just accept that . Route 1 has been the successor to the 452 Mk 2 Ryewood service, which was the successor to the 452 Mk 1 Commuter service, which in turn was the successor to the S2 Commuter service. The original S2 (and daytime S1) were initially subsidised by Sevenoaks District Council in a period of “no overall control” in the mid-1990s to reduce traffic to the station and the town. The period of subsidy allowed the service (like most bus services, it was poorly advertised) gradually to gain ridership. There was a community spirit among the S2 users, and there used to an annual “bus party” summer barbeque in Chipstead. When the Council axed the subsidy after a change in political control Arriva converted the service to the 452 and, with a reduced morning service, ran it on a commercial basis for several years. With established ridership and using an existing bus and driver at times that it was not required for school services the service was viable. In retrospect the s106 funding to extend the 452 to Ryewood and run it through the day upset this arrangement. While it gave a superior service during the period of subsidy, the service as a whole was not viable commercially. When it was proposed to axe the 452 Mk 2 we talked to Arriva. All the local management had changed and there was no corporate memory of the previous 452 commuter service and its viability. We did however encourage Arriva to develop their new concept of a cheaper “mini-bus” service and this was eventually launched as the Route 1. However there was a gap between the demise of the 452 and the launch of the 1 that meant that users needed to be regained. The poor advertising of the 1, the strange route that you mentioned, and the lack of comfort on the minibuses all made this difficult. 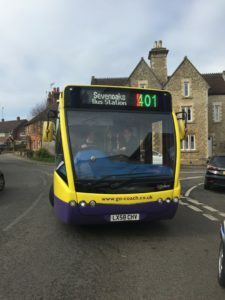 It’s good that Go-Coach are prepared to have a go at meeting and growing the demand through an enhanced 401 service – they’re a young(-ish) and innovative company, and have a record of spotting opportunities and growing the service (cf the Hildenborough commuter bus). But the test is whether enough people are prepared to use it.